Survivors of Wednesday's earthquake move past heaps of rubble in Yushu County, China. (CNN) -- The Dalai Lama, the Tibetan Buddhist leader long exiled from China, is seeking to visit the Tibetan region rocked by a deadly earthquake this week. In a statement issued Saturday from Dharamsala, the northern Indian town where he lives, the religious leader said the devastated region is where he was born and that he wants to go there to help people cope with the tragedy. "To fulfill the wishes of many of the people there, I am eager to go there myself to offer them comfort," said the Dalai Lama, who went into exile in 1959 after an aborted Tibetan rebellion against Chinese rule. "The Tibetan community in exile would like to offer whatever support and assistance it can towards the relief work. We hope to be able to do this through the proper and appropriate channels as soon as possible." The magnitude 6.9 quake struck the country's Tibetan region on Wednesday. Rescuers have been working around the clock to pull survivors from the rubble. The death toll from the earthquake reached 1,484 late Saturday, according to relief officials quoted by China's official Xinhua news agency. Xia Xueping, a rescue official, said 312 remain missing and 12,088 were injured, with 1,394 of them in serious condition. 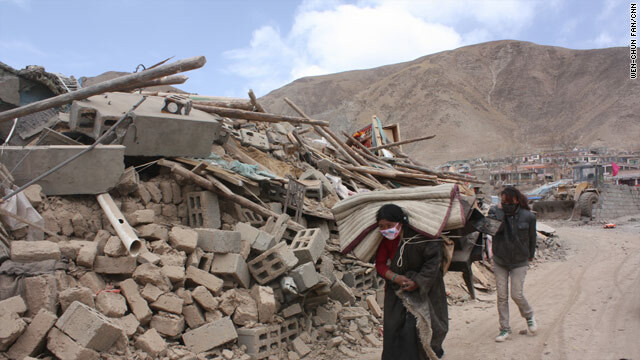 The powerful quake struck the impoverished county of Yushu in China's Qinghai province. It toppled about 15,000 homes in and around Yushu, and caused more than 100,000 people to flee the area. In Jiegu, the town closest to the epicenter, people were taken to a sporting field serving as a makeshift hospital; there are no hospitals in the town. More than 85 percent of Jiegu's poorly constructed mud and brick houses collapsed. On Saturday, monks there chanted Buddhist prayers as hundreds of victims were cremated on a hillside. Ethnic Tibetans have accused Chinese soldiers of not doing enough to help in the immediate aftermath of the quake, an allegation the Chinese government denies. But the Dalai Lama on Saturday praised Chinese authorities for visiting the predominantly ethnic Tibetan region. He singled out Prime Minister Wen Jiabao for offering comfort to people in the region and overseeing the relief efforts. He also said he appreciates the freedom given to the media to report on the quake and its aftermath. The Dalai Lama wanted to visit victims of the 2008 earthquake in Sichuan that killed about 70,000 people, but he wasn't allowed to visit China. He visited Taiwan last year when it was struck by a typhoon. As for Tibet, the Dalai Lama said that "because of the physical distance between us, at present I am unable to comfort those directly affected, but I would like them to know I am praying for them." Qinghai province in northwestern China is home to about 5 million people and is considered a gateway to Himalayan Tibet. About half its people are Han Chinese, but the area is home to more than 40 ethnic groupings, including Tibetans, Hui and Mongols. "I appeal to governments, international aid organizations and other agencies to extend whatever assistance they can to enable the families of those devastated by this tragedy to rebuild their lives," the religious leader said.